The principle is pretty simple: take your audio signal and split it by frequency into different bands. For instance, anything below 300 Hz would be your low band, anything above 8000 Hz would be your high band, and what remains in between would be the mid band. Now you can apply selective processings to these individual bands that will affect only a particular frequency range and leave the other bands unaffected. You could for example compress the mid band only, or apply a reverb to the high band only, and if you are into more experimental music, there are a lot of exciting possible effect combinations. Ususally multi-band processing is confined to a particular effect unit (ex: multi-band distortion) but as Rack Performer is a modular environment, it works at a higher level, making it completely open to any kind of processing. 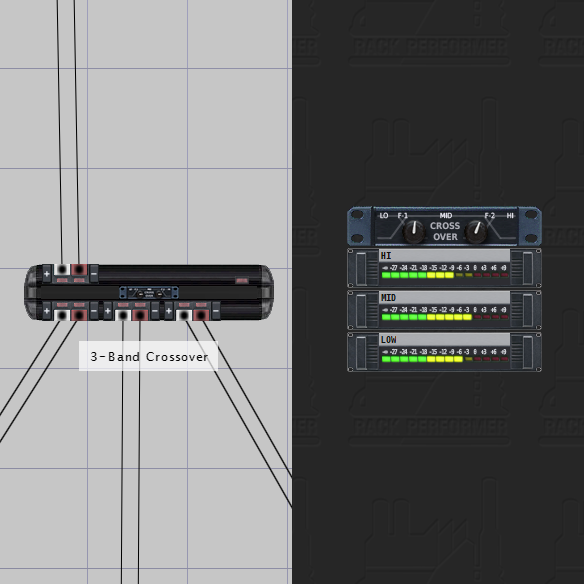 The 2-, 3- and 4-Band Crossover modules have one output per band in the patcher and can handle up to 7:1 signals. You can see the 3-Band Crossover patched on the left part of the screenshot above, and on the right part, in action with simply 3 Peak Meter modules connected to its 3 outputs. We hope you will enjoy this new addition to the toolbox!